Gauging performances throughout the F1 field following Sunday’s Japanese Grand Prix at Suzuka, Crash.net F1 Digital Editor Luke Smith brings you his driver ratings. For the third race in a row, it’s a perfect 10 for Lewis Hamilton. Once again he was domineering, clinical and fuss-free in his display throughout the race weekend, controlling proceedings from start to finish on raceday at Suzuka to move onto match point in the title fight against Sebastian Vettel. In fact, the only part of the entire weekend he didn’t lead was Q2 - and even then he was only 0.03 seconds shy! He may have been the bridesmaid once again, but Valtteri Bottas put in a decent display throughout the Suzuka weekend, comfortably running as the second-fastest driver. He gapped the rest of the pack by a second in Q3 on Saturday, and despite late pressure from Max Verstappen as they scythed through lapped traffic, P2 always seemed in hand in the race. Suzuka was the low point of Ferrari’s season as Vettel saw his title hopes take their heaviest blow yet. The wrong tyre choice at the start of Q3 cannot be blamed on Vettel, but the mistake on his lap that left him P9 can be. A decent start was then undone by the move on Max Verstappen that resulted in contact which, while he was fully entitled to go for, backfired in bad fashion. At no point this weekend did Vettel - once a Suzuka specialist - look like a real threat. A largely underwhelming display from Raikkonen at Suzuka, where he has not finished on the podium since his win in 2005. He did well in qualifying to grab fourth despite Ferrari’s error, and lost out early in the race after being pushed off the track by Max Verstappen. But a slow opening few laps of his second stint cost him places to both the penalised Verstappen and, more damningly, Daniel Ricciardo, who had started 15th. From there, Raikkonen’s race was largely written, with P5 being about all he deserved. Daniel Ricciardo will have left Suzuka once again considering what could have been, with his podium drought since Monaco continuing. A throttle issue in Q2 meant he started down in P15, from where he produced a stunning charge up the order, getting the jump on Raikkonen with a brilliant first stint en route to P4 overall. Had it not been for the problem on Saturday, Ricciardo could well have been in the fight with Verstappen for the podium. Verstappen’s making a habit of impressing at Suzuka, having scored his third straight podium at the track on Sunday with a run to P3. He did well in qualifying before a desperate and immature attempt to keep Raikkonen back early in the race landed him a deserved time penalty. But excellent pace from there allowed Verstappen to rather comfortable keep his position after pitting before a late charge drew him close to Bottas in P2. Force India’s status as the best of the rest is getting harder to dispute following a well-executed team display at Suzuka. Sergio Perez led the team’s charge, getting ahead of one Toro Rosso - Brendon Hartley - at the start before then jumping the other one - Pierre Gasly - by getting the undercut in the pits. He then passed Romain Grosjean after the Virtual Safety Car, with the Haas driver’s electrical failure certainly contributing to the pass. Nevertheless, it was a job well done from Perez at Suzuka. Ocon may have lacked the outright pace of Perez at Suzuka, but he was also able to bring home a couple of points in P9. He too got the undercut on Gasly through the stops, yet could not pass the struggling Grosjean in the closing stages, leaving him nine seconds shy of his teammate come the chequered flag. Another weekend for Williams to try and find some positives from, with Lance Stroll’s advancement to Q2 perhaps being the strongest one. Stroll was penalised for forcing Fernando Alonso off-track on the opening lap, with the two-stop strategy followed thereafter leaving him last of all. Sirotkin struggled in qualifying compared to Stroll, yet looked stronger in the race. Williams pitted him early under the Safety Car, but the late second stop dropped the Russian to 16th at the finish, just behind the two McLarens. A real shocker of a weekend for Nico Hulkenberg. A mistake in FP3 saw him crash hard exiting the Esses, and while Renault managed to fix up the car in time for qualifying, Hulkenberg was then eliminated in Q1. A massive drop-off in pace towards the end of his first stint saw him sink down the order before ultimately retiring due to an issue. On a weekend that saw Renault struggle for pace, Carlos Sainz Jr. did well to come away with a point to show for the team’s efforts. Recovering from a Q2 exit on Saturday, Sainz put in a solid first stint on the Softs before switching to Mediums, with passes on Marcus Ericsson and Pierre Gasly giving the Spaniard P10 at the finish. Judging by Suzuka, though, it is looking like an increasingly difficult task for Renault to keep Haas back in the constructors’ championship. 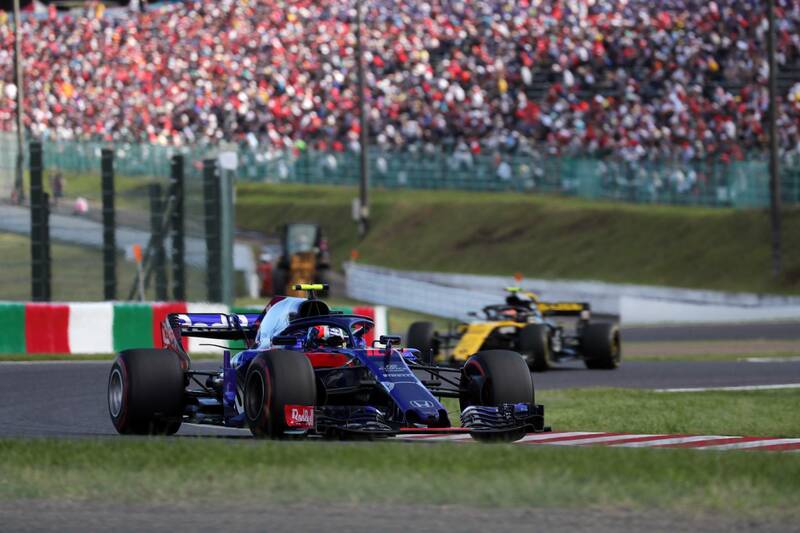 Honda's first home race weekend as Toro Rosso’s engine partner held a huge amount of promise after qualifying, with Gasly starting seventh behind teammate Brendon Hartley. However, it descended into a tough loss. Gasly managed to hold position through the first stint, getting ahead of Hartley, only to then struggle on the Supersofts. The decision not to pit to cover off the Force Indias backfired, dropping Gasly down to P10 before he was passed late on by Sainz, leaving the team without points. Brendon Hartley was one of the stand-out stars of qualifying on Saturday at Suzuka, yet things turned sour very quickly. Too much wheelspin off the line dropped Hartley to P10 on the opening lap before losing more positions through the opening stint. He then suffered on his tyres in the same was Gasly did, leaving him marginally ahead of the McLarens at the finish. Grosjean may have been angry about his position loss to Perez in the final stint, yet he can still be proud of his display at Suzuka. The fastest midfield driver in qualifying, Grosjean spent much of the race running without any telemetry or data going back to the pit wall after a small fire on his car. He was disappointed with eighth, feeling Perez had closed unfairly under the VSC, yet it was another four crucial points for Haas in the fight versus Renault. A third race in four without points for Kevin Magnussen, whose run-in with Charles Leclerc on Lap 2 ended hopes of a top 10 finish after a disappointing Q2 exit the previous day. The FIA saw that both drivers moved at essentially the exact same moment, making it an unfortunate racing incident. Leclerc may have been fuming, but it was Magnussen who lost out the most, suffering a puncture that ultimately led to his retirement. Never one to waste a chance to toot his own trumpet, Fernando Alonso claimed his qualifying lap at Suzuka on Saturday was one of the best he has ever driven at the track. (He was 18th.) In the race, his decision to completely miss the chicane was the only way he got ahead of Stroll, with the resulting penalty being totally justified. A big load of ‘so what?’ from Alonso. Vandoorne’s qualifying misery may have continued at Suzuka with yet another Q1 exit, but he was decent in the race, finishing less than a second behind Alonso at the chequered flag. For all of the fawning over the Spaniard’s display, credit where it’s due for Vandoorne. After his qualifying crash on Saturday, Marcus Ericsson did well to battle up the order for Sauber, rising from last on the grid to finish 12th. Another canny strategy play from the Sauber pit wall saw him do a long stint on the Mediums after pitting under the Safety Car, which the Swede managed well to finish on the fringes of the points. The less said about his bump into Leclerc under the Safety Car the better, though. Charles Leclerc looked up for a fight at Suzuka, starting P10, only for his race to be compromised early on after the run-in with Magnussen. He was back in contention for points after pitting for a new front wing under the Safety Car, only to then retire due to an issue on his car.